The Aquazone is the latest in the Signature range of Swim Spas. 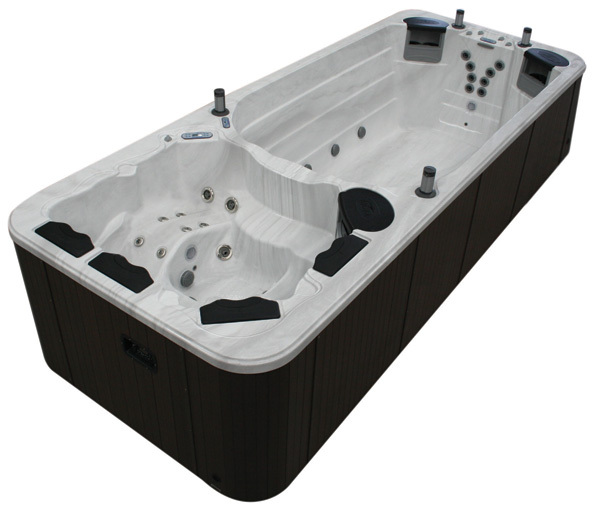 This spa has been designed with dual temperature controls, allowing you to relax in the warmth of the jetted hydrotherapy seats in the spa end, or swim continuous laps in the cooler swim end. Available in three models. Dual temperature control allows you the option set different heating zones in the spa and swim end, so that you can enjoy the spa at 38 Deg C for all your hydrotherapy needs and the swim end at 20 deg C for exercise. Showcasing a 5 seater spa and spacious swim area, this truly is a complete fitness centre and a perfect addition to your outdoor living area. Optional Hybrid Heating System available on this model.